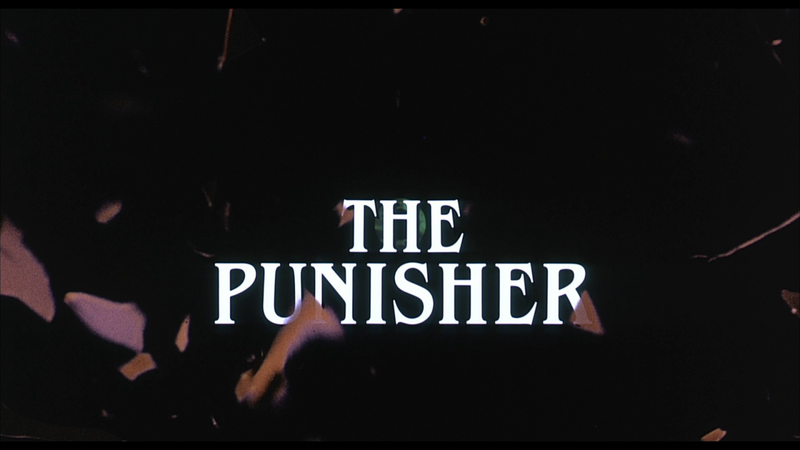 Three cuts of the film, plus a host of other special features. Australians know how to treat this film right. 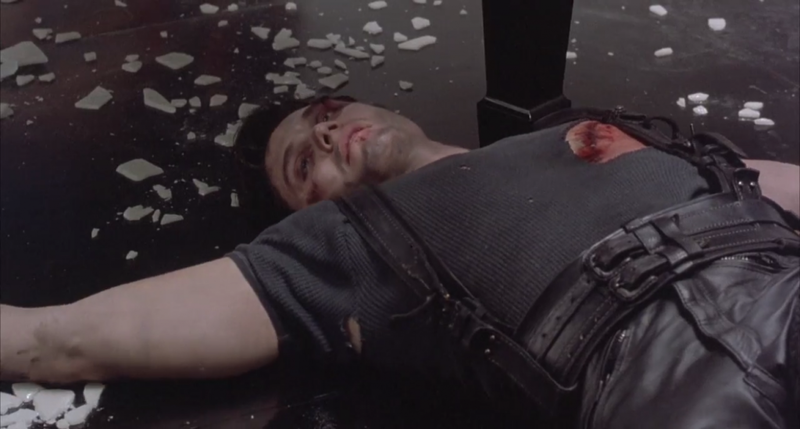 When The Punisher was sent to the MPAA to be rated, they gave the film an “X” for the violence. 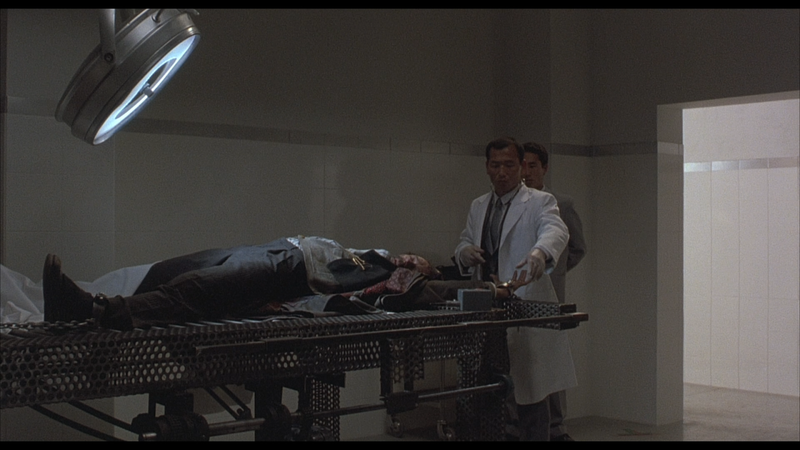 The filmmakers had to go back and cut some of the more gruesome shots out of the film. They only had to cut ten seconds to obtain an “R”. For years, fans of the film have had to settle for bootlegs of this “Unrated Cut” that came from overseas. The bootlegged version was very poor as it was many generations away from the original source. Fans ate up this bootlegged version because it was all we had. Now we have this version. While it is not in HD, the picture quality is still pretty good. 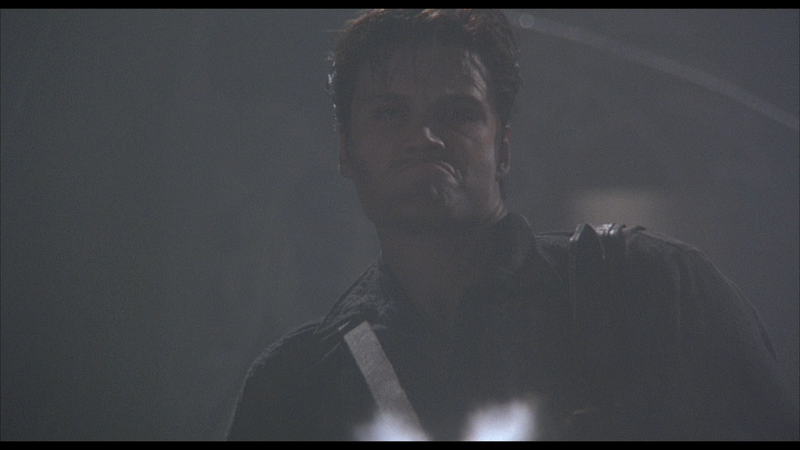 However, whenever the cut footage is shown it is in really bad shape. No clean up or enhancements to be found. To me, this is ok as it is the only way to get the full uncut version of the film. 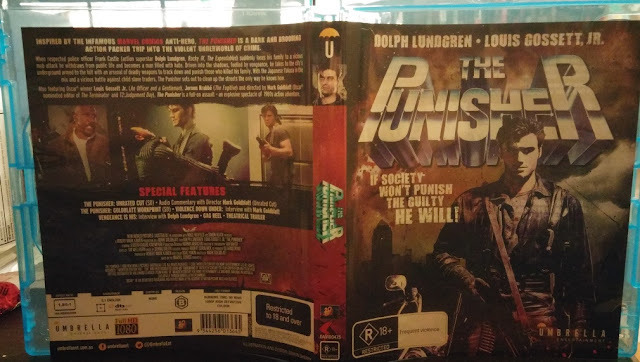 I do wish that Umbrella Entertainment, who released this disc, or Severin, who produced the special features, had done what Scream Factory and Arrow Films have done and edit the uncut footage into the HD print of the R-rated version. 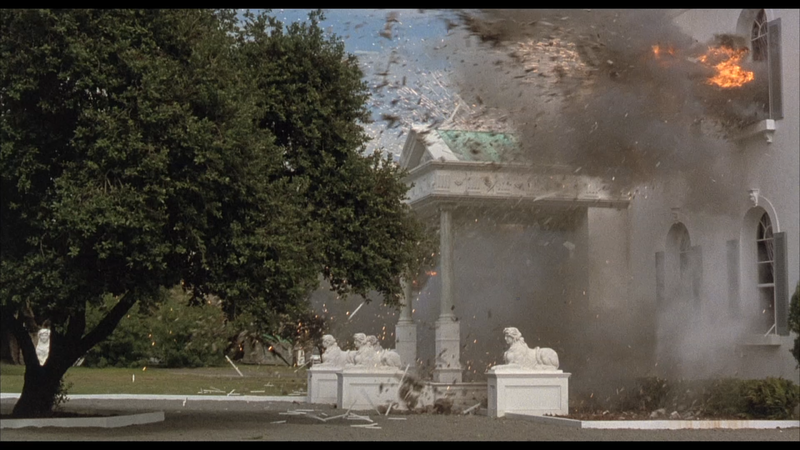 This would have allowed for two versions of the film in HD and transition wouldn’t have been too bad. Maybe one day some dvd company will come along and find the uncut version on film. That would be nice. Goldblatt provides us with an excellent commentary. He knows how to tell a story, his story, and he does it very well. We learn about all sorts of things here and he expands on some of the stuff from the featurette that his is in. 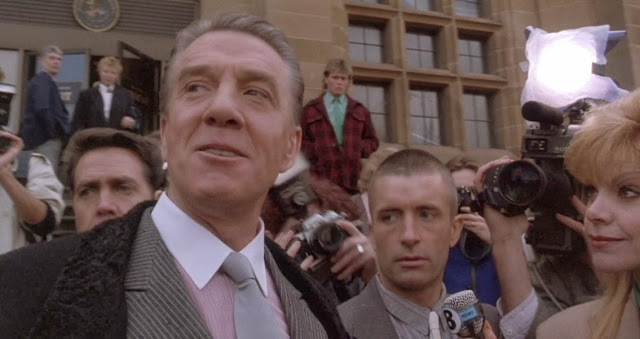 I had no idea, until this release, that this film was shot, wholly, in Australia. When I looked at the licence plates I can tell, but before that, never knew. He also talks about how he loved shooting in Australia and how they got some of the stunt men from Hong Kong. Great commentary. This is the version that Mark Goldblatt had come up with when the film was first edited. It gives the Frank Castle character more screen time with his wife and family before they are killed. 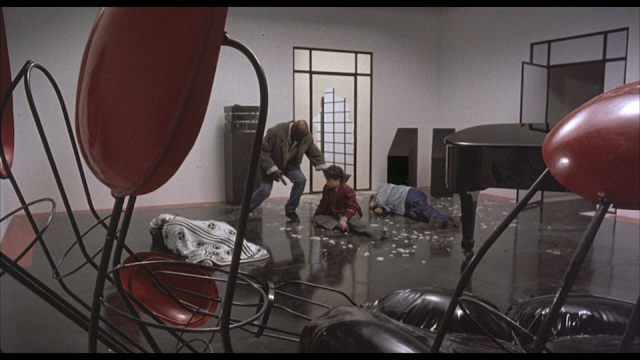 In the theatrical version we don’t get to see too many of these scenes and they are mostly told in flashback. 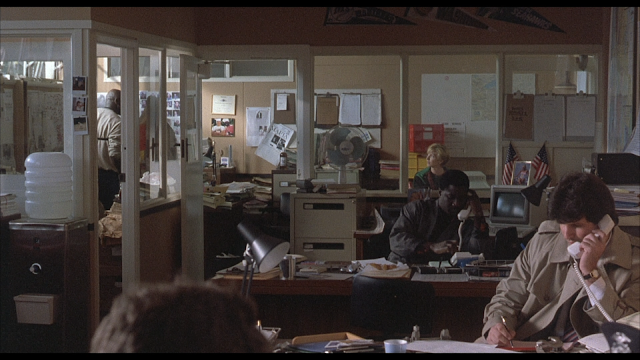 We also get some more scenes between Lundgren and Gossett Jr, who plays Franks ex-partner in the film. 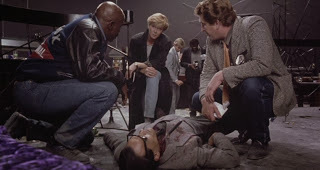 In fact, Gossett Jr. is in the scene when the family is killed, but for some reason they cut around him. I thought that this version of the film was good, but it needs to be tightened, as some scenes play too long. I love the added scenes and believe that at least some of them should have been included in the theatrical version. 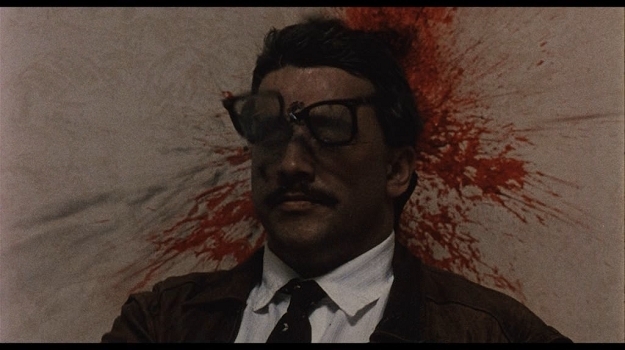 This is also another way to see all of the Uncut Version extended death scenes. Mark Goldblatt gives us a wealth of information about the making of the film. He was contacted by Robert Mark Kamen, who wrote The Karate Kid as well as a lot of films with Luc Besson) and offered him the job of directing The Punisher. 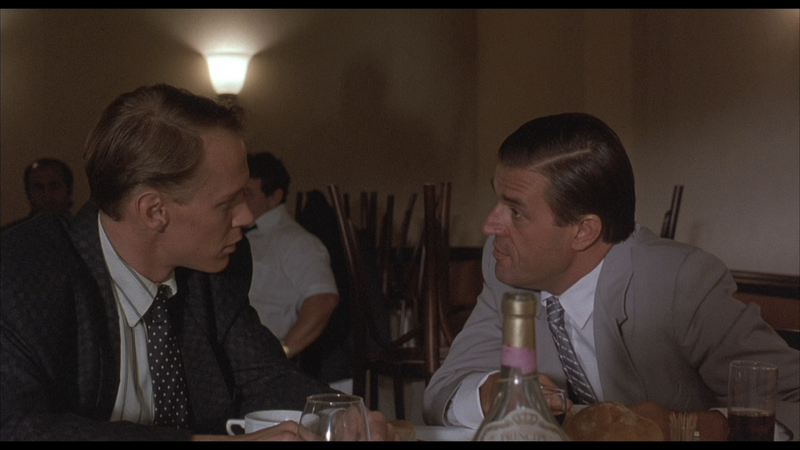 New World Pictures and Robert Mark Kamen came to an agreement to have Goldblatt direct the film and New World would put up the money as well as release the film. He also talks about meeting Stan Lee and getting Lee’s blessing on the film. Lee would later reveal that he didn’t like the film because he found it too violent. Goldblatt also talks about his views on R-rated films which seways very nice into his history as an editor. 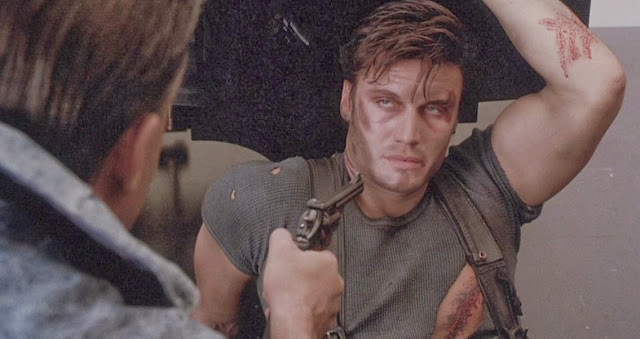 Goldblatt has edited some fantastic film like the first two Terminator films as well as Nightbreed, Predator 2, Piranha, and Commando. 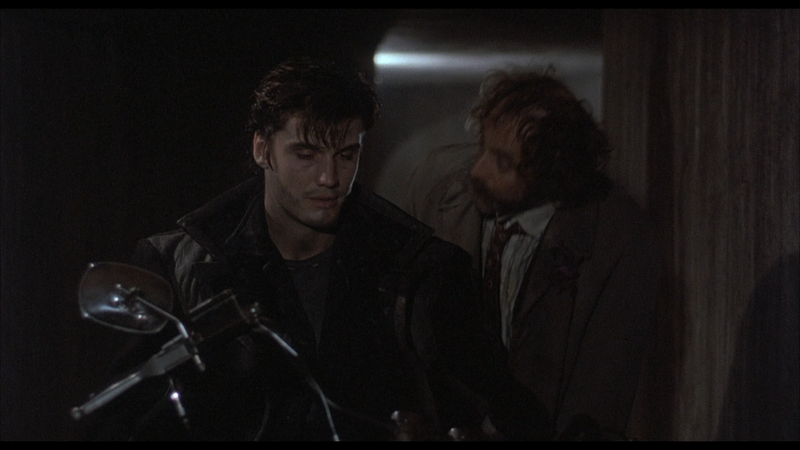 Talk moves back to The Punisher with Goldblatt revealing that Christopher Lambert and Steven Seagal were both talked to about starring in the film. 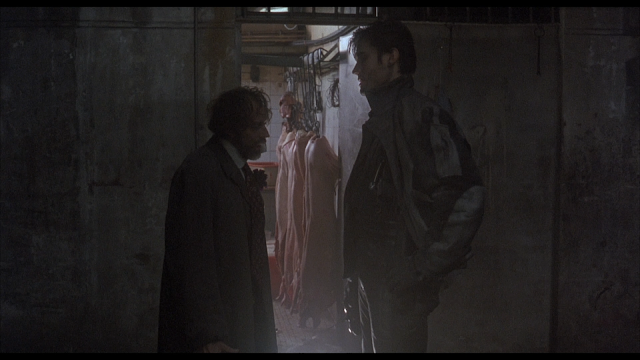 Lambert was walking on a crutch and Seagal had other offers, so they went with Lundgren instead. Goldblatt also talks about leaving the skull off of the clothing (a mistake) and the subsequent direct to video release of the film is the States because of New World falling apart. This is a really good interview. It does seem a bit all over the place and this is why the pace of the interview is off. There is a wealth of information, though, so this counts as a good interview in my book. Lundgren is interviewed inside of a gym before (I think) his normal workout. Lundgren talks about filming in Australia, where he went to college) and how it was nice to see his old friends. He also speaks very highly of the stunt team that worked on the film. He likes the film but is disappointed that that most of the family scenes were cut, as well as with the release of the film in the States. This is a good interview. I have always been a big fan of Lundgren (my first laserdisc was a Dolph Lundgren film called Pentathlon, which wasn’t very good, but he was) and I found him very inviting here. He just seems like a really nice guy who loves making films. It is a shame that this interview was so short. Lundgren probably had very little time to talk and that is why he is interviewed in his workout gear. Still, it is a good interview. This is more of a behind the scenes montage than a gag reel. We see a lot of the cast and crew having fun on set. There are a few gags here, but it is mostly BTS stuff. Most of it is also silent except for the song that plays over the footage. This feature and the trailer MAY be in the PAL format. I watched the entire preceding special features on my REGION A blu-ray player. When it came to these two special features the player just went to a black screen. Nothing would happen, so I had to stop the disc and restart it. After a few times of doing this, I put the disc in the REGION A blu-ray player that is in the living room. Again, a black screen. Finally I tried it on my REGION FREE player and the two special features worked. I wanted to bring this to everyone’s attention. EVERYTHING ELSE works on a REGION A player. Just a regular run of the mill trailer that highlights the story and the action. 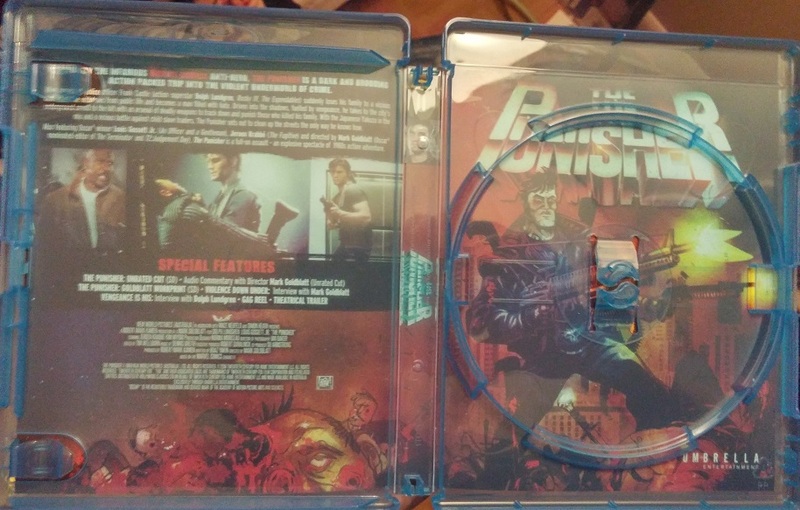 The disc comes in a regular U.K./Australian blu-ray case (14mm). 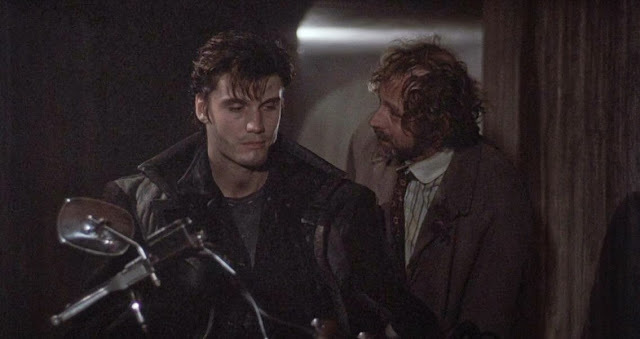 The retail cover art shows Lundgren standing in the foreground, wearing a leather coat and sporting a machine gun, while standing next to a motorcycle. A city outline is seen in the background and “THE PUNISHER” title hangs over Lundgren’s head. There is a reverse side to the artwork that has an artist rendition of Lundgren firing his machine gun while standing amongst the corpses of those he has killed. 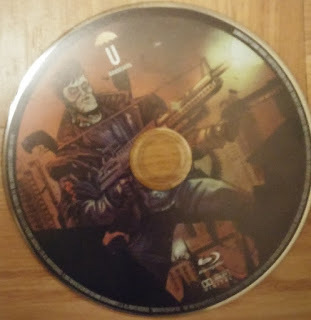 The disc art is the same as the reverse artwork. This is a one disc release and the disc is REGION FREE, but read above in the “Gag Reel” section for a problem that one might encounter if their player is REGION A. Umbrella has given us a dated transfer in the film’s original aspect ratio of 1.85:1, but this is not to say that the transfer is bad. It is good for the most part. Because the transfer is dated there is very little depth to the picture, resulting in a very flat looking display. 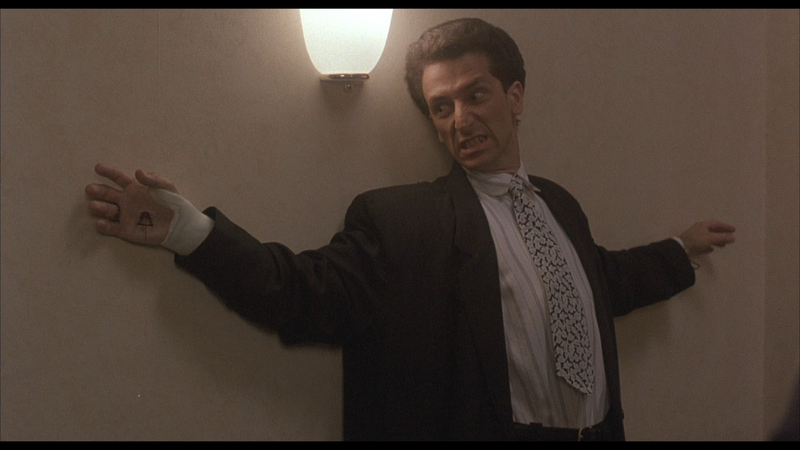 The close-ups show a fair amount of detail, but the wide shots are less detailed. There is good news, though. There has been no digital manipulation (No DNR, haloing, etc) which does make me happy. There is a fine amount of grain, which I also liked. Sporting a 5.1 DTS-HD Master Audio track, The Punisher sounds a little bit shallow. The track is not very aggressive, which was not what I was hoping for. This is an action film, so the track should be very lively and aggressive. The dialogue is clear and there were no audio hick-ups that I noticed. I was in junior high when The Punisher hit video stores after a two year wait. The film was supposed to be released in theaters in 1989, but New World Pictures, the company that financed the film, went under and the film was sold IVE Entertainment. 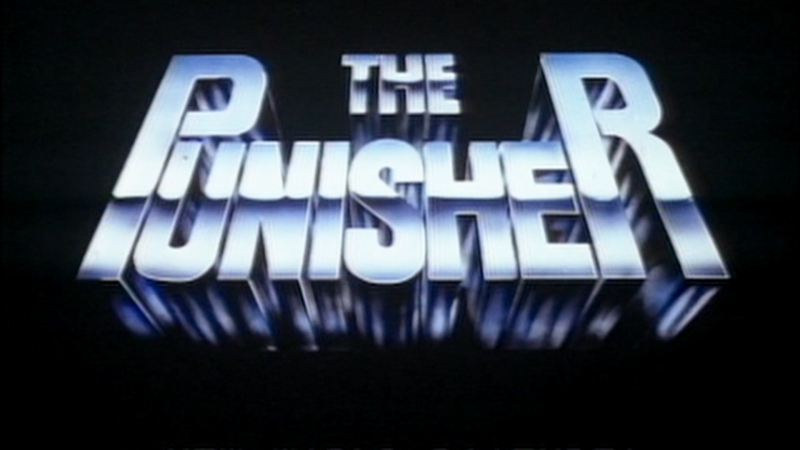 Known as a company that released the films that they picked up on VHS, The Punisher was relegated to the direct-to-video market, where it did very well for the company. 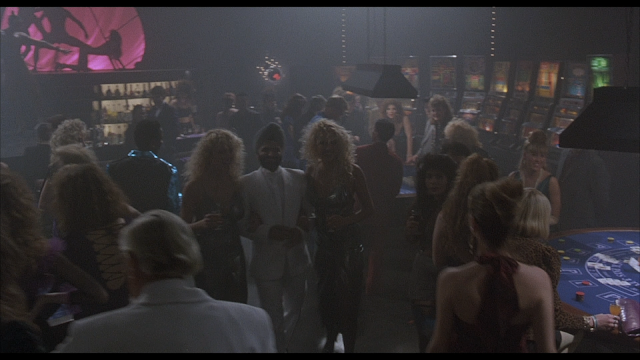 I had wanted to see the film in theaters and even saw some talk about in various genre magazines of the 80’s. After the film missed its original release date, I fell out of touch with what was going on. When the film then resurfaced in my local video store two years later, I was excited. I remember going home and watching the film and being a little disappointed. 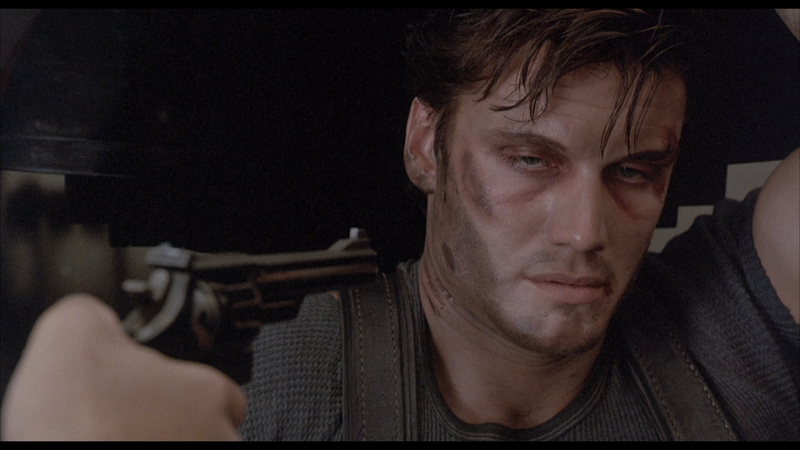 The action was there, the dark tone was there, Dolph Lundgren was there. What could have happened? Well, after 25 years I can say that my younger self was suffering from “hype”, something that I held onto for the two years that I had to wait for the film to hit video. Because of that wait, the hype kept growing. It grew so big that no matter how good the film was, it would turn out to be a stinker. I can tell you now, after rewatching the film, that it is a good film. It isn’t great, but it isn’t bad either. 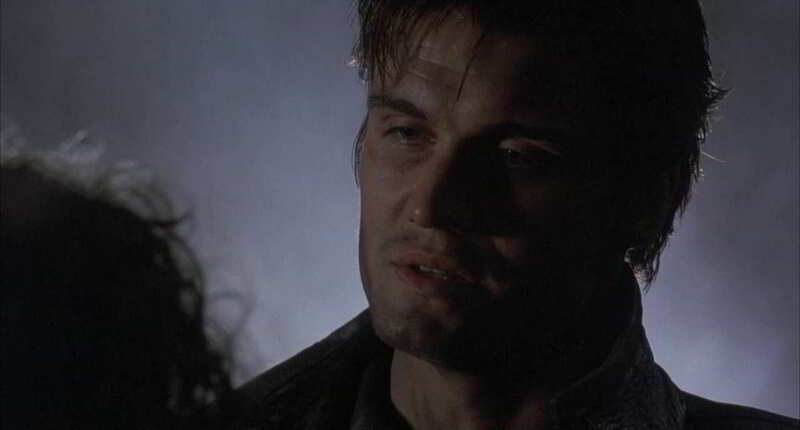 The film stars Dolph Lundgren as Frank Castle, a cop whose family is killed in a car bombing. 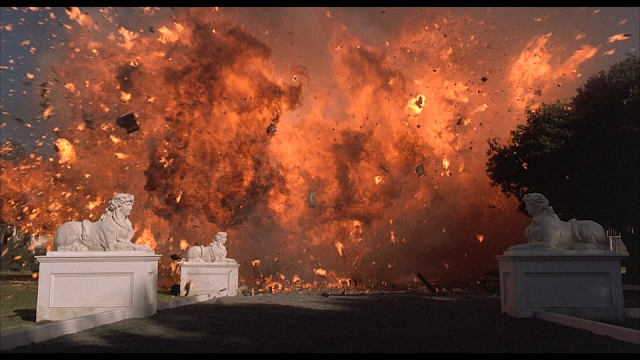 The mafia thinks that Castle was getting too close to their operations, so they killed the family, and what they thought was Castle, in the bombing. Castle was there but he survived. Castle has now become The Punisher, a man who lives in the sewers and fights crime, kind of like the Teenage Mutant Ninja Turtles, only more violent. Castle works alone, but is tailed by his former partner, played by Oscar winner Louis Gossett Jr, who wants to help Castle, but also wants to put him away for all killing that Castle has been doing. 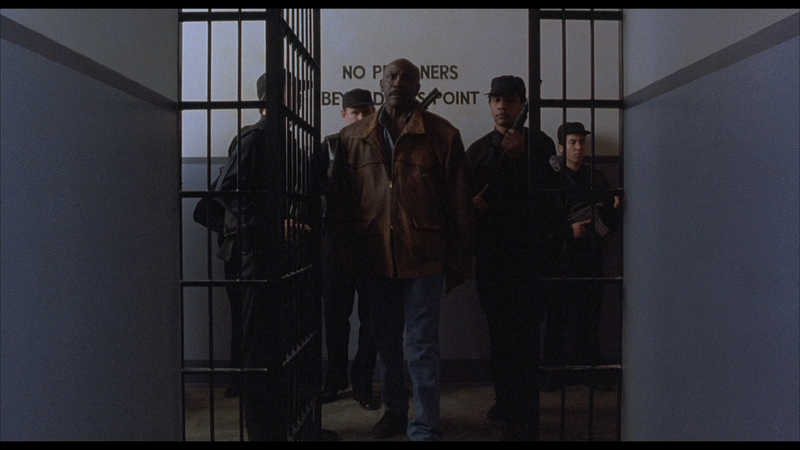 Gossett Jr is great in the film, giving a little bit of grounding that the film just doesn’t have on its own. 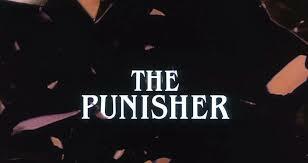 I have heard people say that The Punisher is a bad film and they take offense to all the changes to the character and his world. To that I say: whatever. These people have to realize is that The Punisher was the third comic book character to hit the big screen (at least that was the plan). Before this film, we had Superman and its three sequels, and Batman which was in production at the same time as The Punisher. No one really knew how to adapt comic books into film very well so this was a time of chance. They had to see what worked and what didn’t. The same year that The Punisher was supposed to be released in the theaters, we had Batman, which was a cultural phenomenon. After Batman, the waters were still shaky. Sure, Batman and Superman were very profitable at the box office, but the latter Superman sequels were not. The studios were afraid that their comic book adaptations would be more Superman IV: The Quest for Peace and less Superman II. Even lessor known comic book films that did make it to the big screen were not accepted. Spawn, which was released in 1997, was supposed to be a big hit for New Line Cinema, and while it did make money, the film was a dud. The Punisher was being made, the filmmakers were just trying to make a good film with the character of the Punisher. They really didn’t care that he didn’t have the skull on his shirt (which Goldblatt admits was a miscalculation). They just wanted to stay true to the character and I believe that they did. The Punisher film is a good film. It isn’t great, but it is a fun watch. It is filled with so much 80’s cheese that they should just rename the film to “Wisconsin”, but that is what most people like about the film. How many times, during the 80s, did the hero or heroes fire their machine guns at inanimate objects, destroying everything in that area? Now, how many times do you see that today? 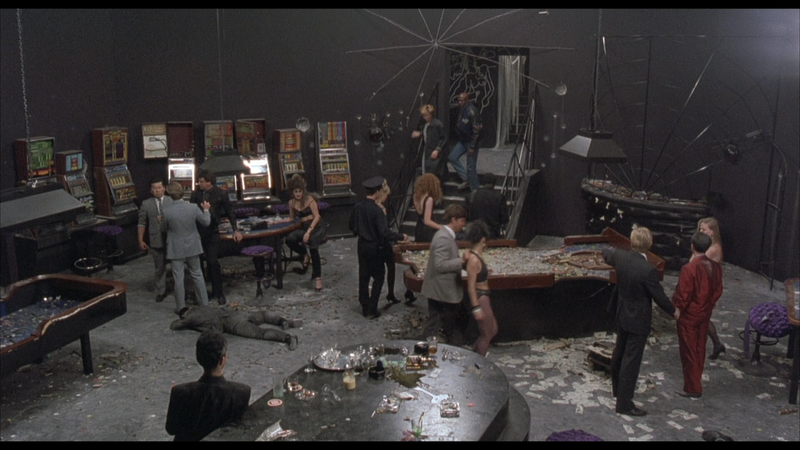 The Punisher contains just such a scene where the Punisher crashes through the window of a backroom casino run by the main baddie. He lands on a craps table, grabs one of the henchmen, tells said henchmen to deliver a message to the boss, then goes onto destroy the casino with his machine gun. This film is wild and crazy and a good time. 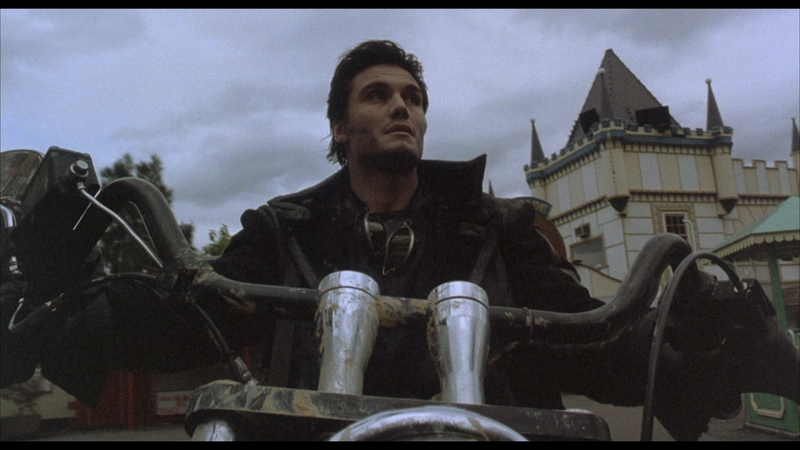 It doesn’t reinvent the genre, but it does get the job done while being a badass 80s film. You owe it to yourself to watch this film. Umbrella Entertainment has given us a nice package in the form of this blu-ray. We get the 3 versions of the film (two are not in the best of shape, but are watchable) and we get some worthwhile extras. The picture and sound are good and the film is cheesy 80s goodness. 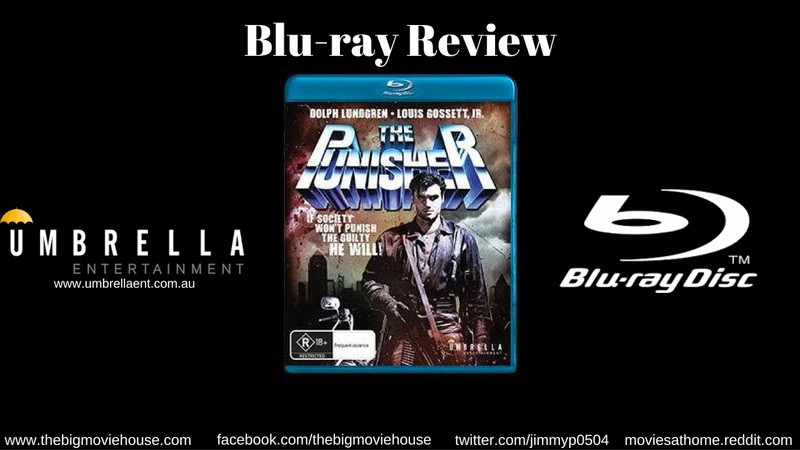 I would recommend this to anyone that likes action films and/or 80s action films. Definitely worth the money. 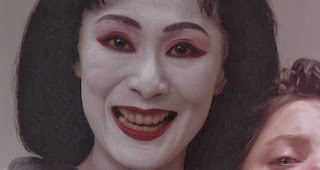 Taken from the theatrical version. They should have went with the workprint title.